Cheese Crack: Over-The-Top-Addictive Cheesy Snack Crackers | Let's Cook With Bry! Words cannot even begin to describe how tasty these snacks are! 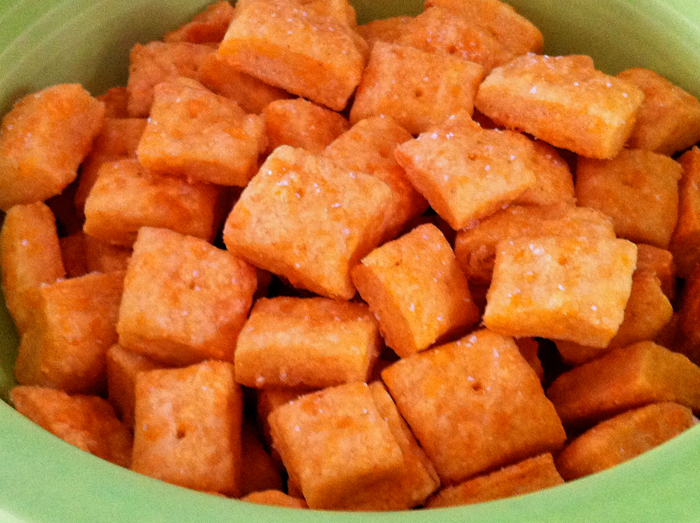 If you are a fan of Cheez-Its (and who isn’t, really? ), you will flip out over this easy-to-make facsimile. The original recipe, introduced to me by my pal Marci, is posted here, and it’s a more descriptive (and cleverly written) photographic version than what I’m posting in my own blog. I took these to a dinner party last week, and the conversation came to a screeching halt as everyone descended upon the quickly disappearing platter of decadent delicousness! BE WARNED: RESISTANCE TO THE AROMAS AND POWERFUL FLAVOR IS FUTILE, AND SELF CONTROL WILL BE NON-EXISTENT. Combine all ingredients except the water in a food processor (or mix in a bowl first, if using a small processor, and work in batches). Pulse until crumbly, and transfer to a bowl. Add water, a tablespoon or two at a time, and continue to mix until it forms a dough. Roll into a ball, wrap in plastic wrap, and freeze for 30 minutes. Preheat the oven to 350°. 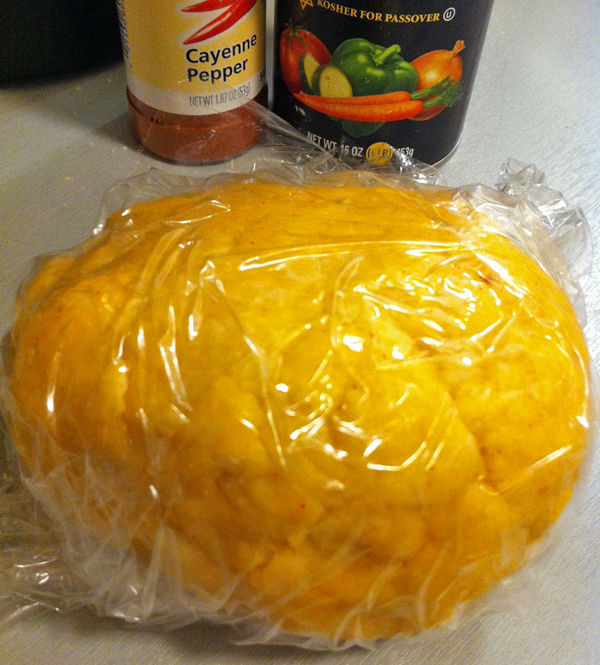 Meanwhile, remove the dough from the freezer and place between two sheets of parchment or wax paper. Using a rolling pin, flatten dough until it’s about 1/8 of an inch. It’s important to get the dough very thin, as it will rise when baking. Line your cookie sheet with parchment paper, non-stick aluminum foil, or just grease/butter the pan. Transfer the dough onto the pan, then cut into small squares with a pizza cutter, pastry wheel, cleaver, or some such device. Separate each square, otherwise they’ll stick together as they bake. 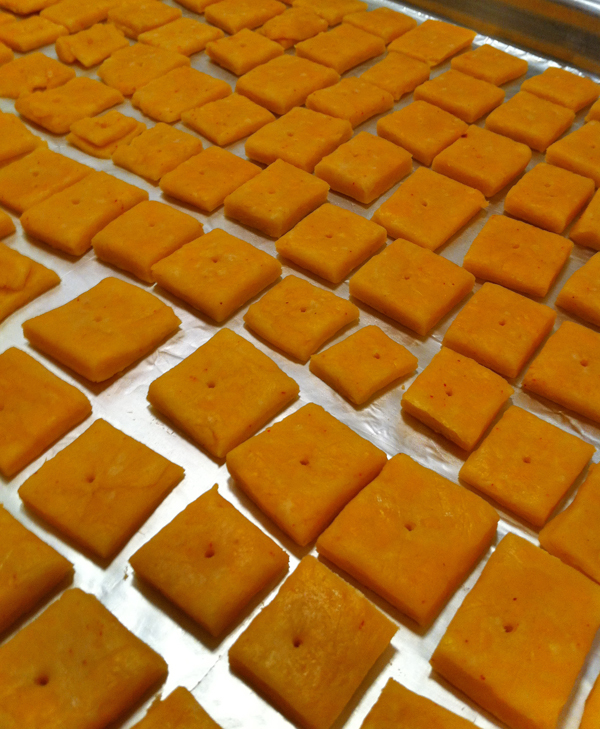 You can use a toothpick to poke each square in the center to keep them from rising, and also to make them look more like Cheez-Its, but this is an optional step and is not critical. Sprinkle lightly with salt, and bake for 20-25 mins, until the bottoms are golden brown. While the aromas will no doubt cause you to uncontrollably salivate like Pavlov’s dog, avoid the temptation of removing them prematurely from the oven, as the flavor and texture do improve when they are fully baked. 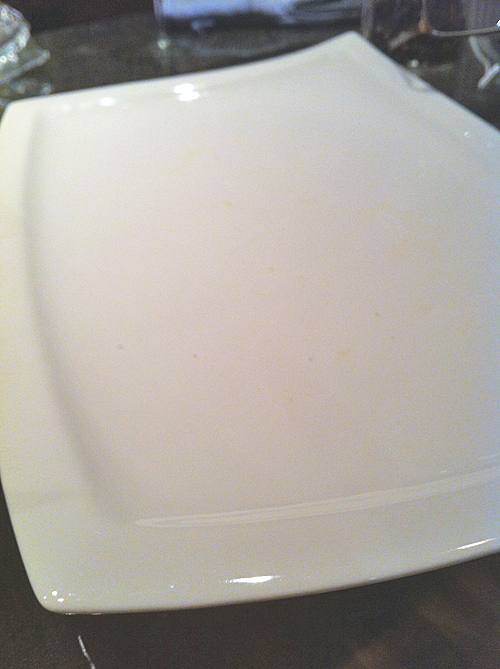 An empty platter – EXACTLY! Which is what you’ll have mere seconds after serving! If not immediately and voraciously consumed, I found, as did the guests at that dinner party, that they are even more delectable when reheated for a few minutes in a toaster oven before serving.